The weatherman was right last night. Today, this morning, is wet. 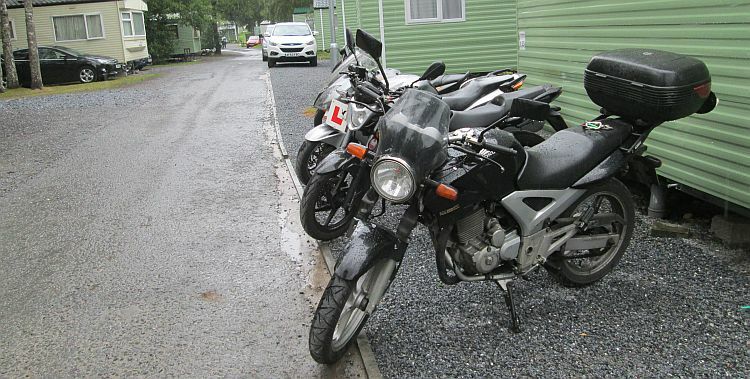 It's not a deluge it's light rain on and off but the roads are wet, the bikes are wet and the washing I hung out on a bungee cord yesterday is also wet. Oh well, we've had 2 good days, it can't all be fun fun fun can it. Today I think I'll have an easy day. The road we're on continues on to a place called Rannoch Station and ends there. On the map it looks remote. It also looks like it's about 25 miles away, 50 miles return trip in which case it ought to be a nice, simple, easy ride. It's not a washout, but yeah it's a bit wet. RG and JR are going to go into Pitlochry to have a wander around the shops so there's just the gf and I. Rather than ride straight there and back I study the maps and find an interesting route. We can take the B846 south, first left onto what seems to be an unnamed and unnumbered track and this will take us via the south side of Loch Rannoch. We can then return via the B846 on the north side of the loch. As soon as we set off I can feel what the ride will be like today. The rain is a intermittent drizzle, the air is cool yet luckily the wind is but a light breeze. We have all the time in the world to travel a mere 60 or 70 miles if my estimation of the detour is correct. We are both on small capacity bikes, the gf's 125 and my 250. These empty Highland back roads are remote and wild. There is only ourselves to look after, I can sense this ride is going to be a slow one. Oh please, don't think this is a bad thing! 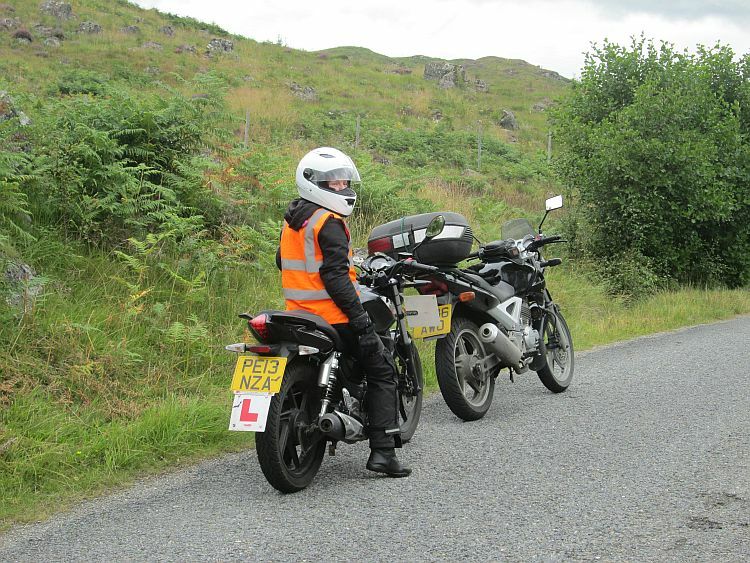 We do love the thrill of a fast ride but equally, perhaps even more so, when the circumstances are favourable we both revel in the delights of riding slowly. It is a rare thing indeed to find such roads that allow this, to find the vacant lanes where our sauntering pace doesn't cause tailbacks and angry drivers. It is so relaxing and comfortable to potter along at 20, maybe 25 miles per hour. The light rain is not driven hard into our faces it merely washes over us. We roll around the bends, rise and fall over the undulations and slow even more when a stunning scene unfolds before our eyes. We stop often, side by side to point out the landscape and the houses and the curious nooks and crannies. It is in thrilling stark contrast to the bustle of our town lives. It is refreshing to feel unhurried with time and space all around and in abundance. "Where's me camera?" Just a chilled ride on a wet Wednesday. We turn off the B846 and the road becomes single track. These moorlands are bleak, solitary places and while I'm as happy as can be I imagine a lonesome ancient Scot or Pict wandering these moors in search of shelter, warmth and perhaps company. I am surprised that there is an occasional house to be seen here and there. I'm not sure I would want to live quite this remotely, now I imagine a howling gale and a branch knocking on the bedroom window, it's the stuff of nightmares. We can stop safely whenever we feel like it. The moors fall back to the shoreline of Loch Rannoch. This lane is the quiet lane, across the loch we can see the odd house and farm, at one point even a collection of buildings. On this side there's a house every few miles our so. They're imposing houses, big with lots of land. Some are unkempt and the wilderness is doing it's best to reclaim it's rightful heritage. Others are crisp and modern, I'm reminded of the program "Grand Designs" with trendy architecture, lots of full length glass and verandas where pretentious wealthy folks might sip Pimms or Scotch while admiring the loch. A sign points to a campsite and we have time to look, maybe with a view of returning one day. What the sign doesn't say is that the site is down a long gravel forest track. Oh crap, the gf's not going to be happy. I stop a few yards in and she is looking a little, er, concerned. "Turn around or carry on?" To my surprise she up for carrying on. I've ridden a fair few of these over the years but this is a whole new ball game for the gf, she is learning a new skill. When we stop we discuss how as a road rider the notion of the tyres and wheels moving about beneath the bike is a terrible sign of impending doom. Here on the gravel and mud it's something you just have to accept, within limits. She also wonders how I know what may lurk beneath the murky waters of a puddle. I don't, it's just hope. I bore her with a tale of soggy boots when once I found a puddle to be much deeper than expected. After about half a mile the track ends in a quiet simple campsite. There's no reception or shop just a wooden toilet block and some lush green grass with bins and the occasional tap. This is camping at its most basic. A sign declares that you should pitch up and at some point in the day a warden will come and take payment. If we want bars, entertainment, dancing girls and a swimming pool then we're definitely in the wrong place. It is blissfully peaceful and pretty. The gf avails herself of the conveniences and I watch a bedraggled camper wander across the wet grass in search of water. 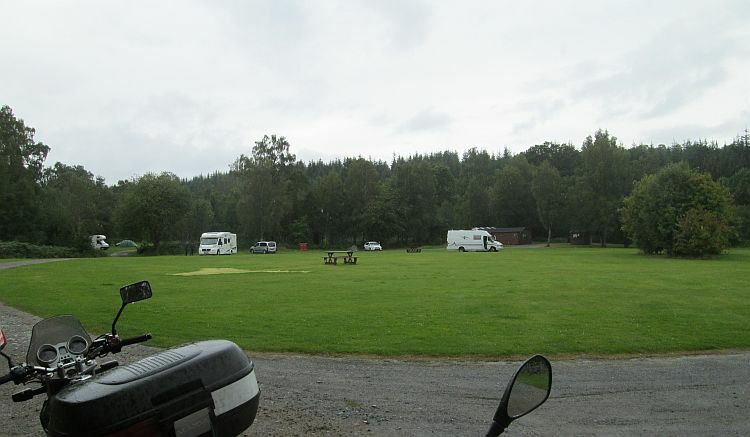 There's not a lot at the Kilvrecht campsite, just the basics. Peaceful. Back on the solid tarmac of the lane we carry on, still dawdling at cycling pace. A car appears behind us, we just pull in and wave it past. The rain stops and there's even dry patches of tarmac here and there. By golly it's a long way at this pace but I don't want the road to end. It is calming to not fear the chance of gravel or diesel, of a deer running across our path or blue lights and speeding fines. This is movement at ease while surrounded by nothing but water, trees, mountains and sky. At the end of Loch Rannoch we rejoin the B846 for the last few miles to Rannoch Station. The Loch has gone we're now on the moors again alongside a tumbling white water river. A curious caravan is parked in a small rugged field by the river and from what we can see an elderly couple sit on deck chairs drinking tea. Are they holidaying or do they live here? We'll never know. 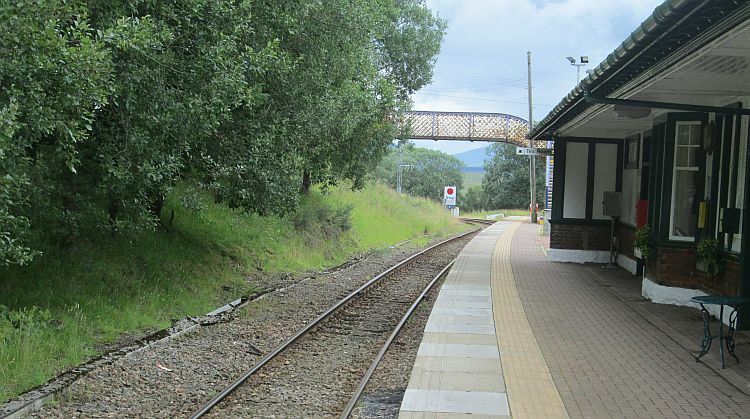 Rannoch Station comprises of a car park, less than a handful of white houses and down in a cut lies the station. There's a sign for a cafe on the station, I think we're in need of a brew. 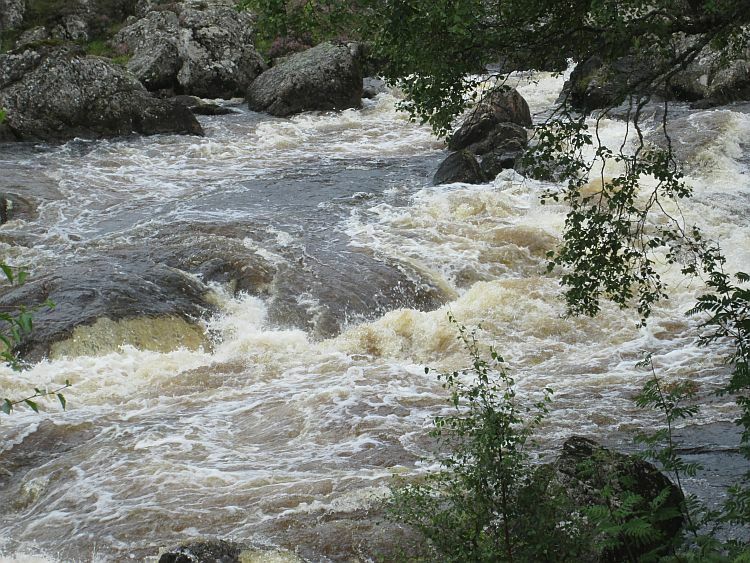 The River Gaur broils it's way down to Loch Rannoch. The shiny rail tracks and the timetable all suggest this station is still in use. However it looks like it's not been modernised since the 1930's. 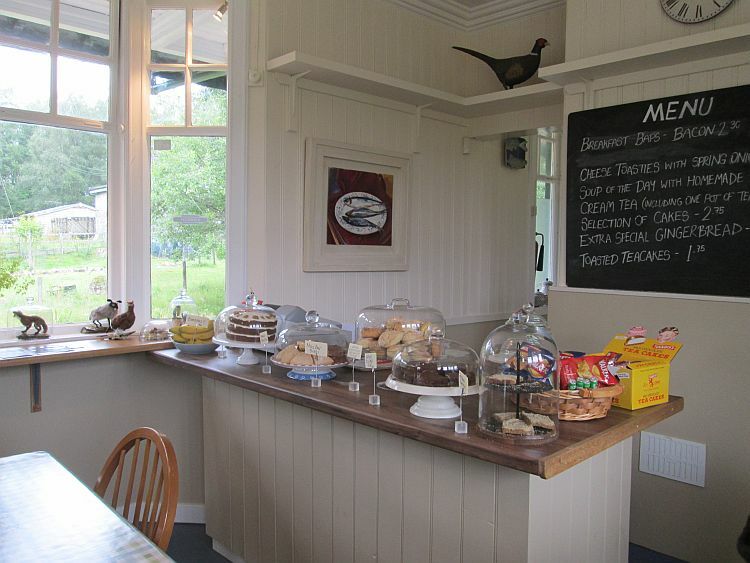 This is an ideal setting for a Miss Marple mystery, even the cafe is twee and trapped in time. We have a brew and a scone each, some might call this "High Tea", the gf calls it daylight robbery. She wouldn't mind but the bacon butties seem quite reasonable so she thought the scones might be too. Oh well, we eat and drink while a fly buzzes it's last on the windowsill and a modern local train stops to let no-one off or on. We are having an adventure and adventures should be unpredictable, I suppose. "I think we're in a time warp darling." We keep to the main road on our return, as much as this is a main road. We're still bumbling along but now we have to let a car past every 5 minutes or so, it's that busy. 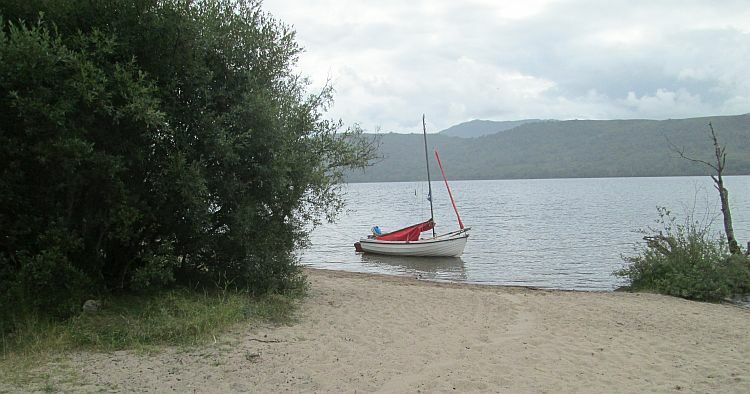 There's a few more houses, the odd farm and curious small sandy beaches at the side of the loch. Free camping is the thing here, camping fishermen fish, alternative hippy types lounge about outside early VW camper vans and small fires are lit in circles of stone. It's not crowded, we only see 4 or 5 of these unofficial pitches over a 15 mile run. As we approach the only village of Kinloch Rannoch we pass the massive Macdonald Loch Rannoch Hotel. After the emptiness of the previous 50 or 60 miles this building feels imposing, overpowering and regrettably out of place. Houses or perhaps holiday homes next to it have curious conservatories for roofs and these make the whole complex ever more peculiar. On reflection there's probably nothing wrong with all this, it's just unexpected and a shock contrast to everything else. At least the village of Kinloch Rannoch fits the surroundings well. 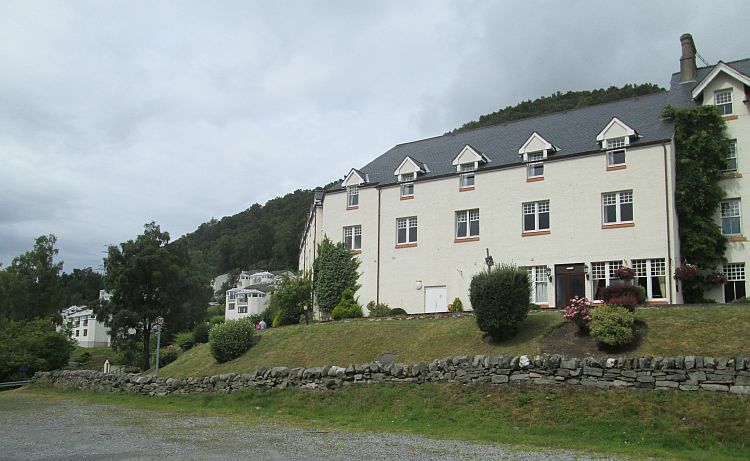 Macdonald Loch Rannoch Hotel, bit of a shock to the system. Back at the caravan I'm surprised that JR and RG are back. They have been soaked to the skin. What? We've had showers, a few grey skies and even a hint of sun in places. They however have had downpour after rain after downpour. We've only been no more than 50 miles apart, it's a curious thing the British weather. They have coats and pants over every radiator and fear they'll never be dry again. The gf and I, smug in our fortunate choice, throw our slightly damp overjackets into the spare room. It's just the luck of the draw I suppose. After tea the sun is trying it's best although not succeeding very much. The gf, RG and I take a short walk down to the bridge that is, I presume, Tummel bridge. There are in fact 2 bridges. One looks quite ancient although it has a tarmac surface. The other is an ugly thing that looks like it was intended to be temporary but has become permanent, it ruins the rest of the scene. 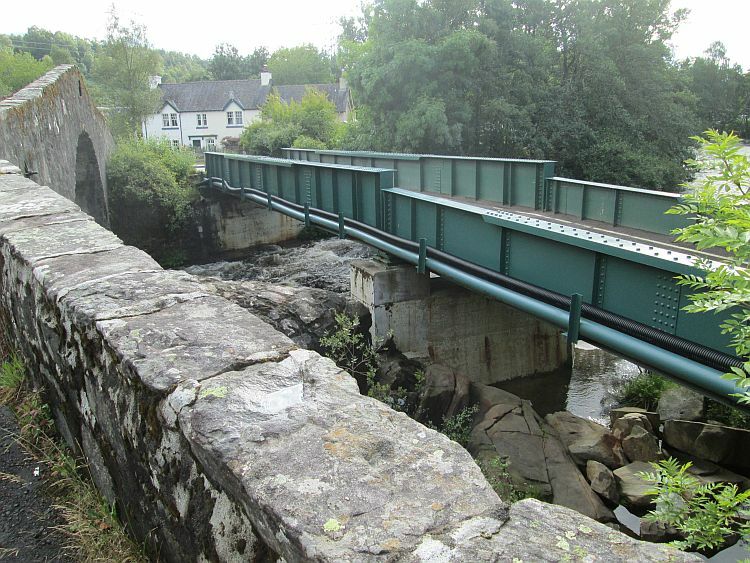 A river flowing and tumbling through the valley, trees and mountains, an old stone bridge, traditional Scottish dwellings...and an ungainly metal girder covered in tarmac and painted in engineers anti-rust green. It's obvious why the new bridge is here though. The old one is steep and the crest is sharp enough to bottom out a coach, lorry or even a long van. RG must have his mischievous head on. 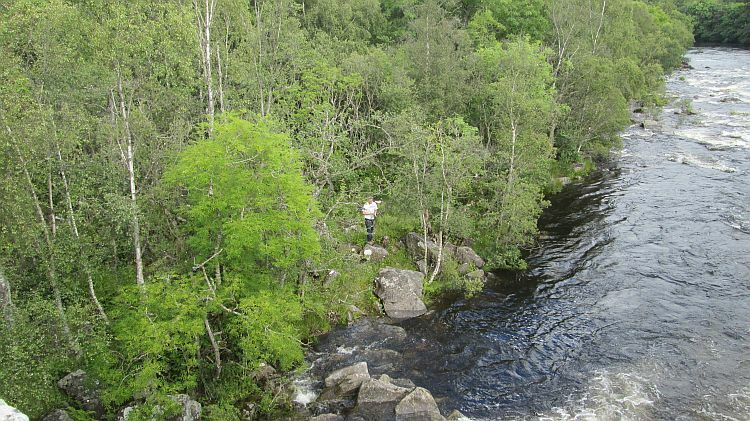 As the gf and I take snaps RG climbs down the side of the river among the trees and rocks. I don't know what has compelled him to do this, perhaps he thinks he's still 9 years old. Then he's under the old bridge. I have visions of him falling in and being swept away. He survives his little escapade and eventually returns to the safety of the footpath. Muppet. RG up to no good whatsoever. RG returns to the caravan, the gf and I stroll a little further. We find a massive sub-station, shiny, new and still surrounded by the trappings of construction. I don't know how I feel on seeing this. It certainly spoils the remote wilderness feeling of the area there's no doubt about that. All around the highlands can be seen large pipes, large plain mill-like buildings, concrete weirs and damns. There's a lot of hydro-electric infrastructure which utilises Scotland's rain and lochs. This is all green energy and this green energy is a good thing, helping to keep the clean Highland air...clean. I don't like it spoiling the wilderness but I still want to watch TV, go online, heat my hot water and light my caravan tonight. I can't have it all. It's been a lazy day today, I think we all needed to re-group and re-charge. Tomorrow promises something different again, we're off to visit acquaintances in Forres east of Inverness, an area I've not been to before. 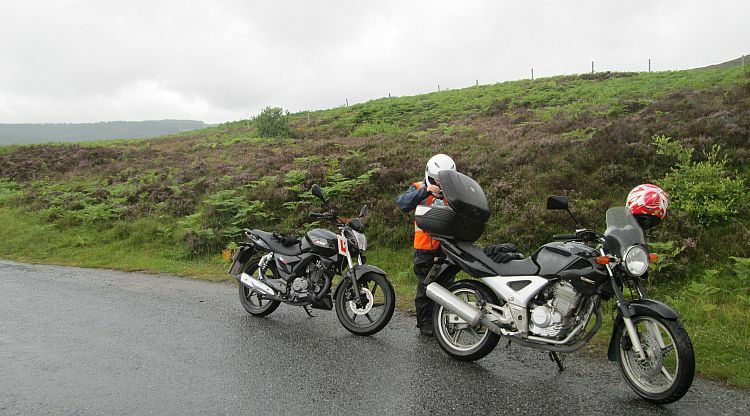 There'll be at least another 180 miles and probably more if we have time to explore. Best get to bed as we'll need to be on the road by 0900 again.